Tom Brady has "respect" for the players who chose to take a knee during the national anthem before football games last season, the New England Patriots quarterback told Oprah Winfrey in an interview. Brady said the controversy surrounding the kneeling protests prompted "a lot of good healthy conversations ... in our locker room." "I respect why people are doing what they are doing. And they’re doing it for different reasons, and that’s okay. You know, you can do things for your reason. They can do things for their reason, and you have respect for that. But, I thought it was great," Brady told Winfrey. In the interview, a clip of which was released ahead of the full special this weekend, Brady talked about how the Patriots "chose to lock arms" as they walked out as a team after group discussions. "We had meetings after practice talking about how we wanted to deal with that particular situation," he said. "We support what people are going through," he said. 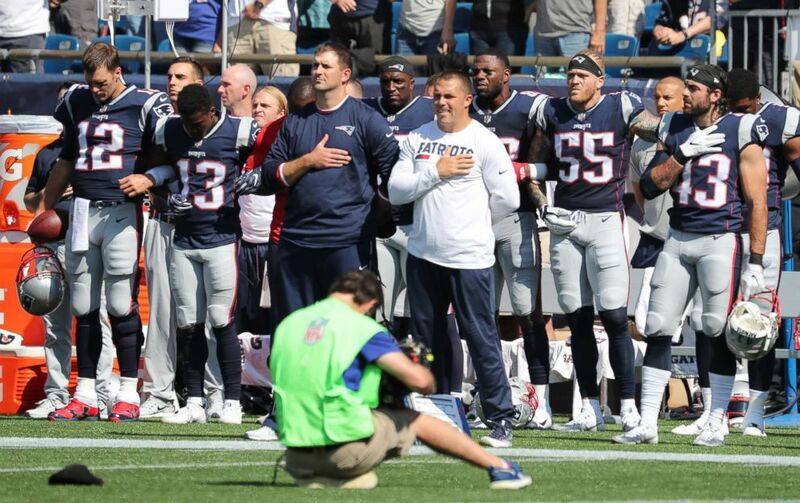 Patriots players during the national anthem before the start of a game against the Houston Texans at Gillette Stadium in Foxborough, Mass., Sept. 24, 2017. "I’ve been playing sports long enough [to know] everyone comes from something different, and I think showing respect for everybody, in a locker room, with a team of guys trying to go in the same direction —- you better have that empathy for everybody. That’s what sports are about," he said. This isn't the first time Brady has talked about the decision of some players to take a knee to protest police brutality. In September 2017, Brady criticized President Donald Trump, with whom he has been friendly in the past, for calling on any kneeling players to be fired or suspended. Brady said Trump's comments were "just divisive." "I think everyone has the right to do whatever they want to do. If you don’t agree, that is fine. You can voice your disagreement, I think that is great. It’s part of our democracy. As long as it is done in a peaceful, respectful way, that is what our country has been all about," Brady said during a radio show appearance.